For the ultimate BBQ this summer, pick up these simple tools to elevate your backyard party. This list of BBQ party essentials will split your planning time in half and allow you time to socialize with your guests and actually enjoy the day. 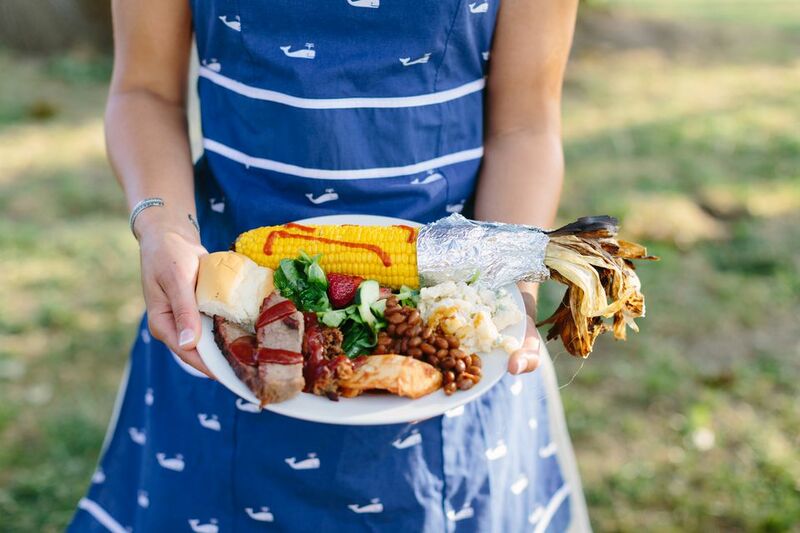 Mark your next backyard BBQ on the calendar and start sending out invites! This checklist will help you get organized like a pro, stress-free and with ease. Festive lighting is always helpful for setting the mood and getting everyone into the summer spirit. As the sun sets on those long, hot summer days, lighting helps transition us into an evening state of mind. The lights create a quiet foundation for the beautiful evening to unfold. Tiki torches are a summer essential that provides additional outdoor lighting and potential protection from those pesky mosquitos. Invest in tiki torches with citronella candles for maximum protection. But with or without citronella, they add a playful touch to your backyard. Light beer or summer ales are great to have on hand for beer drinkers at your party. Keep things simple by choosing only one or two beer options. The most important thing is to have the ice stocked to keep your beverages chilled. Offer a summer shandy as a cocktail idea. Choosing between white and red for summer wine is never fun. Rosé is a wonderful middle ground for your wine enthusiasts. When you choose to serve rosé at your gathering, you avoid an overly complicated drink menu, keeping things simple for your guests. Rosé is also a quick way to elevate the feel of a summer BBQ event. You could even buy an extra bottle and make a ​sweet summer sangria. Have guests serve themselves with an easy-to-use drink dispenser. This way, you'll only be responsible for refills when the dispenser runs low, which might happen only once or twice a party. Have a couple of dispensers on hand just in case. Keep one full of water infused with fresh fruit and the other with a sangria concoction. Seriously, did you remember the ice? Ice is relatively inexpensive compared to other party details, so stock up! You will regret having to ask a friend to do an ice run in the midst of a party. Another idea is to ask that guest offering to contribute to the BBQ to grab a bag or two on their way to your home. There is nothing more essential than ice when hosting an outdoor summer party! Bocce-Ball or Kan Jam are great options, but having any outdoor game available is a helpful way to encourage guests to engage in your event. An outdoor game serves as a wonderful icebreaker for those guests who might not know each other as well. Some other outdoor game ideas are corn hole, Jenga or a simple card game. If you are hosting any event outside, as a courtesy, bug repellent should be readily available for guests. Some visitors might opt to bring their own but this is often not the case. Purchasing bug spray seems to be easily forgotten in the middle of BBQ prep. The repellant might be as essential to a successful BBQ as the ice and grill itself. Keep away mosquitos, flies, ticks and unwanted insect visitors when planning in advance. Seasonal watermelon is a crowd pleaser. You can serve fresh slices up for grabs or in a simple feta, watermelon, and basil salad. For adult fun, try alcohol infused watermelon slices, or a mixed watermelon cocktail. These frozen watermelon coconut mojitos are truly refreshing. It's not summer without a grill and it's not a backyard BBQ without corn on the cob. Summer is the season to stock up on those delicious husks of corn. Corn on the cob is an easy complement to that burger bar and those frozen watermelon cocktails. Guacamole and chips are a classic BBQ starter. Crostini's and Bruschetta are also an easy and fun appetizer for any event. If you are worried about keeping guests full and satisfied, it's always a safe bet to turn to a variety of bread appetizers. Bread appetizers help keep costs low and tummy's full. Plus they are usually no-cook or taste delicious toasted over a charcoal grill. A burger bar is an easy way to satisfy the pickiest of guests. At the least, you will need the burger, buns and possibly some cheese. Ketchup, mustard, pickles, lettuce, tomato, peanut butter, and bacon are some ideas for additional add-ons, so party goers can put the works on their burger fit to their tastes. It's up to you to get as creative as you like for the burger bar menu. A backyard BBQ is just not possible without the grill, and the tool you'll need don't stop there. Once you have your grill situation in order, it's time to next think about what kind of starter pucks and charcoal you might use. You will also need to consider what kind of food will you be serving and what kind of utensils will be needed for prep. Think spatula, tongs, marinade brush, etc. Washing dishes is definitely not a chore anyone wants to be stuck with after hosting a party. Skip the china and expensive dishware for a compostable option. It's better for the environment and easier on you. Guests will appreciate that they are contributing to a sustainable cause as well.